Creatine is allegedly one of the few supplements that are scientifically proven to be helpful. Not only does creatine make your muscle look fuller, but a myriad of studies have shown that it is essential for a fat loss program. There are many benefits that creatine offers to the consumers, but the questions which brands offer the best creatine powders remains unanswered. This article will discuss not only which brands offer the best products, but will also shed light on which are the most cost efficient, check out our best creatine supplements deals category. The king of Value for money on this list. 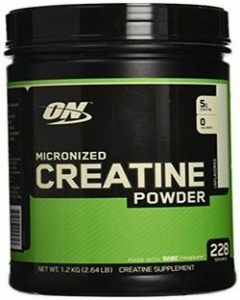 Optimum Nutrition’s Micronized Creatine, is the best selling creatine in almost every supplement website. Every each and one of its reviews shows 100% consumer satisfaction and guaranteed results. And rightfully so, if you are looking for a cost efficient, super high quality creatine, then look no further. The micronized nature of this creatine allows the powder to easily mix with juice and water and does not readily settle to the bottom. Consequently, you won’t have to experience the gritty taste and texture you have had when consuming creatine with lower quality. Each serving of ON Micronized Creatine provides 5 grams (5000mg) of 99.9% pure CreaPure™ brand Creatine Monohydrate. There are many forms of creatine available, each having their own unique properties and benefits. BPI Sports have created a product that combines the top 6 forms of creatine in order to provide an advanced and effective creatine formula that will require no loading period and will have minimal side effects such as bloating. 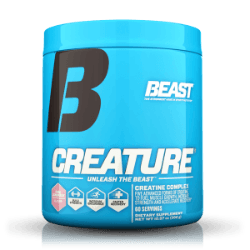 Similar to our top ranked product on this list – RedCon1 TANGO, bpi’s Best Creatine Defined adds to the creatine formula power agents such Betaine. 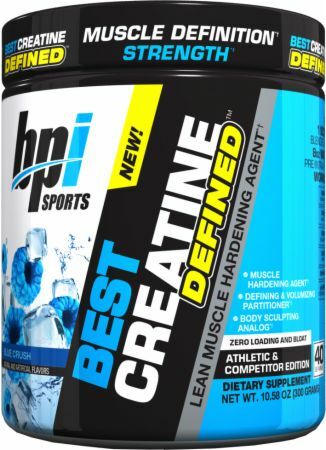 One unique interesting addition in the bpi Creatine is an hardening formula (hence the defined). The main reason it is not ranked as high as TANGO, is that the dosages in TANGO are higher in almost any category. Another point working in bpi’s favor here and bringing it to a respected 3’rd place is flavor which from our exprience and reviews across the board is brilliant. One of the original innovators in the Creatine Supplement world. PreoMera Sports was one of the first companies to step outside the basic Creatine Monohydrate realm into more sophisticated and effective formulas. 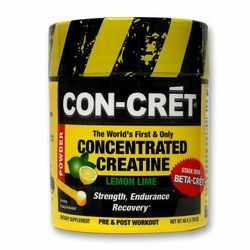 CON-CRET is famous for the small dosages you need to consume to get the effect, mostly due to its solubility. This product digests incredibly easy and thus results in greater absorption and uptake to the muscles. You don’t need for the large quantity of creatine that sits in your gut and leads to bad side effects. Beyond that, rave reviews on flavors & mixability earn CON-CRET a very respectable 4th placing. 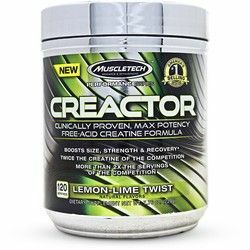 Creactor by Muscletech delivers you a very potent, micro-dose of creatine. Creactor is free of acids and salts and 100% and contains 100% pure laboratory-tested creatine hydrochloride. This product undoubtedly meets every consumer’s expectations and guarantees you improvements in your performance and muscle growth. Creactor improves your ability to regenerate ATP, which is your top source of anaerobic energy, allowing you to recover adequately and faster. When performing high-intensity training Adenosine Triphosphate is utilized first and once its store has been diminished, you need to begin regenerating your own Adenosine Triphosphate. The creatine molecules of Muscletech Creactor are changed into phosphocreatine molecule which serves as a place for regenerating ATP and thus increases your ATP levels. Consequently, you will see that you able to work out harder and recover faster and better. This product was originally created in Germany. It contains Creatine & Magnesium-bound, Creatine AKG (Creatine bound to Alpha Ketoglutaric Acid) and Creatine Anhydrous. 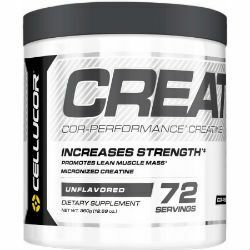 The fifth ingredient of this product is the newest addition to the company – Crea-Trona, which delivers a results-inducing ratio of 94% creatine to 6% buffering agent. As part of the reformulation, Creature® also includes Astragin® and Cinullin®. 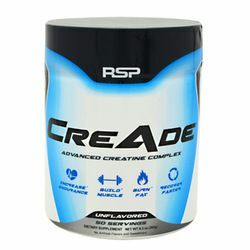 CreAde Creatine by RSP Nutrition contains 5 forms of micronized Creatine, for maximum bio-availability & absorption – COPMax, Creapture, Tricreatine Malate, and Creatine Pyruvate. This product guarantees maximum utilization & absorption during a workout, resulting in muscle gains & increased strength. The Transport Matrix enables creatine transport, regardless of your sugar and carbohydrate intake. Its solubility results in optimal absorption with no need for a loading phase. The reviews of this product show that it delivered great muscle pump during exercise and resulted in a better post-workout satisfaction and endorphin release. The product was made commercially available in 2017. 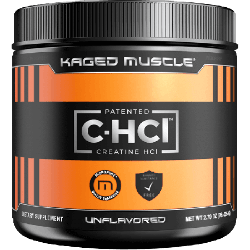 There are many advantages of consuming Kaged Muscle C-HCL, but the most noticeable ones are better solubility ,bioavailability, increased plasma uptake and no bloating or cramping. The faster your body digests creatine, the faster it can go to work on your muscles and that is one of the many benefits of this product. Each serving of this products features 5g of micronized Creatine Monohydrate that breaks down into smaller molecules and thus helps improve the speed of digestion. There are almost no negative reviews to be found related to this product and consumers satisfaction accounts for roughly 95%. It is rated 5 stars in almost every supplement company, which speaks for its high quality. 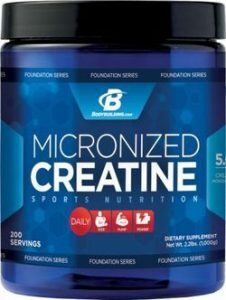 Bodybuilding.com Micronized Creatine is absorbed better and faster than regular creatine monohydrate to support best results. Because micronized creatine contains particles 20 times smaller than the regular creatine monohydrate, it offers what you need – when you need it. Not only does it digest quicker, but it also allows you to mix it up with any sort of beverage and thus make it more delicious and easy to consume. Check out our Bodybuilding.com Deals & Coupons.